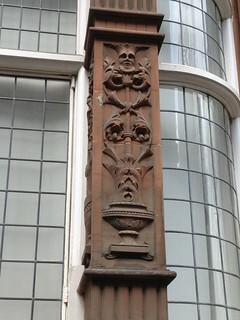 I like to wander during my lunch break, exploring the streets, looking at signs, trying to find unusual sights. I often use the MapMyWalk app on my phone to track where I walk and how many miles. It was a Friday and I wanted to find somewhere new to go. I decided to let Serendipitor take over. I selected "Current Location" as my starting point and "Random Location" as my ending point. "1. Walk north on Palace St towards Castle Ln and then follow a dog until it notices you. Photograph it when it does." I walked up Palace Street and then continued to Castle Lane, but alas, there were no dogs. I kept my eyes peeled, searching the landscape for a dog. 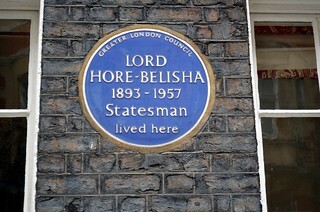 I passed a blue plaque which said, "Lord Hore-Belisha 1893 - 1957 Statesman lived here". I remembered that he had also lived for a while in the village where I grew up, and belisha beacons were named after him. I reached Buckingham Palace and saw many pigeons, a few lions and even a unicorn on my way, but still no dogs. 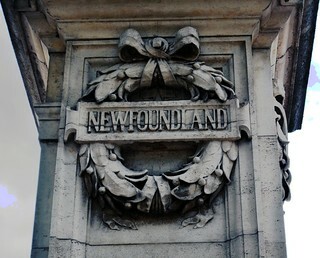 I saw a sign that said "Newfoundland" and thought I must be getting closer. 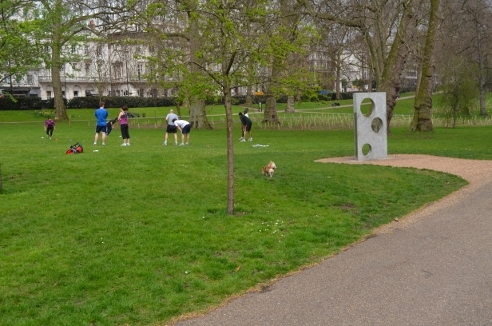 And then in the distance, when I was close to Green Park, I saw two little dogs. I turned back and crossed the road and went into the park, but the dogs were nowhere to be seen. I walked around the park for a while, and noticed another dog, but then the original two dogs appeared again, so I headed towards them. They were walking slightly behind their owners and I followed. It was when the little light brown dog was next to the people doing exercise in the park that the dog noticed me. I took a photograph of a tree so as to look less suspicious to the dog's owner who was calling the dog at that point. Then the owner turned around again and I quickly snapped a picture of the back of the dog. Next time I'll actually try to press the "Next" button, but trying to get a dog to notice me kept me occupied for that lunch break. The Friday after that I decided to try a different, yet similar app: Drift. This one just provided instructions and a compass. My first instruction was: "Walk west until you find an example of change and then take a picture of it." I photographed a flower, as Spring finally appearing seems like a change. "Walk north for two blocks and find an outdoor fixture and take a picture of it." London isn't based on a grid system, so the idea of walking for two blocks didn't quite work, and walking north didn't quite work, and I wasn't entirely sure what an outdoor fixture was, so instead I took a photo of a lion. I now know that I should have been looking for a light, but never mind. The next instruction was: "Walk west for two blocks and find a sign of the local real estate condition and document it." I passed "The Bluecoat school", which had a statue outside it and said "1709". "Walk south for a couple of blocks and empty your pockets on the nearest surface and take a picture of everything spread out on that surface." I had nothing in my pockets, so I stopped at this point. I had no idea such apps existed. How wonderful! On Wednesday I will be back at work after six months off travelling in Asia. I think this at lunchtime could help ease the transition.